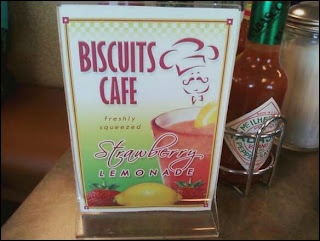 Biscuits Cafe has several locations across four U.S. States (Arizona, Oregon, Texas, and Washington). This blog post covers the Washington location in the Salmon Creek neighborhood, on NE 134th St. I arrived on a Saturday, sometime just before 11 a.m. A bunch of people seemed lined up just inside the entrance, but it turned out to be a short, five-minute wait. I love eating breakfast at all hours of the day and opted for one of their four-egg omelets. Would be a snack compared to the 12-egg omelet I had in Seattle. 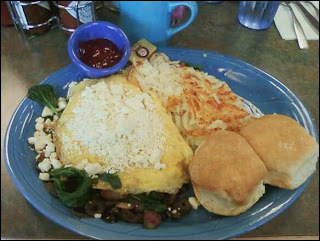 I went with the Fresh Greek omelet ($9.89), containing spinach, diced tomatoes, onions, Kalamata olives, and feta cheese. I chose hash browns instead of red potatoes. 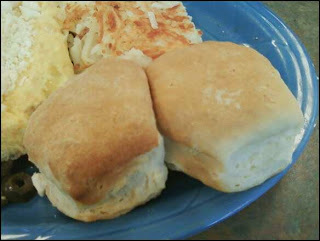 And because it's "Biscuits Cafe," I opted for two of their biscuits (instead of toast or pancakes). When the plate arrived at my table, I saw the abundance of feta cheese on top of the omelet and cringed a bit, feeling that would be way too much for the dish to handle. Over the course of the meal, I incorporated the feta more with the spinach, tomatoes, onions, and olives. It helped with balancing the flavors out. 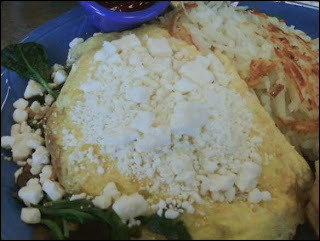 The omelet itself was nicely executed. The veggies inside oddly appeared to have their own segregated sections. Spinach and tomatoes flocked one side, mainly onions in the center, and all the olives on the right side. Not sure if that was intentional. Hash browns had a nice crunchy exterior, soft on the inside. Nice golden brown. The biscuits basically stole the show. It lived up to any hype I would have otherwise put on it. Amazing firm, baked outside, yet fluffy in the middle. Outstanding with the accompanying strawberry jam. 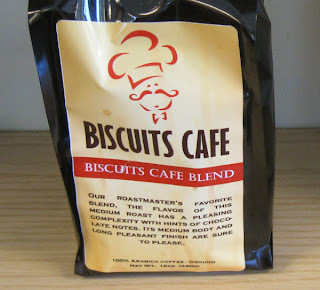 Quite possibly some of the best biscuits I've ever had. The coffee here is Biscuit Cafe's own house blend, a medium roast with a nice, bold flavor. Had myself a few cups. 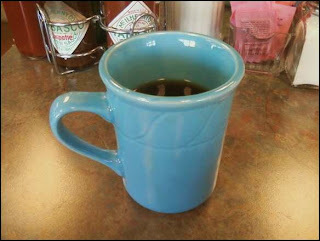 Like at many other places, you'll get free refills here. The large baked cinnamon roll ($3.29) lives up to its size. Unlike other cinnamon rolls I have had, this one has the consistency of a very soft dinner roll. It was basically dry layers of cinnamon inside, with only the smothering of cream cheese icing to add lubrication. That icing really brought intense cream cheese flavor and then some. Server was friendly and did an awesome job overall. 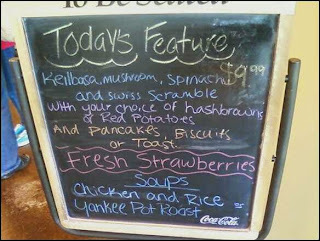 I like how this place allows the customer to "keep it simple" and pick any three breakfast items from a set list for $7.49. You can get biscuits, eggs, some type of meat, hash browns, etc. Heck, it could be as simple as eating some biscuits and gravy. The breakfast menu also has your usual scramble, waffle, and pancake options. The breakfast tacos have scrambled eggs and cheese in flour tortillas along with your choice of ham, sausage, bacon, or chorizo. There's a breakfast burrito option with eggs, peppers, onions, tomatoes, chorizo, refried beans, cheddar, and jack cheese in a warm flour tortilla. Both dishes are served with sour cream and salsa on the side. There are different specials promoted each day. And yeah, I didn't even make it to the lunch menu yet. Mainly burgers, sandwiches, and salads. The burger patties are 1/2 pound. Some sandwiches that catch my eye: a Reuben or a Turkey Cranberry sandwich. I'm excited to try the location in WA :) My sister has an interview there today and when I Googled the location in AZ it sounds amazing!!! I will definitely update this and rate Biscuits Cafe when I get the chance to experience the deliciousness of the menu and politeness of the staff.